All of the John Piper frenzy here at The Center for Theological Studies started with my post titled “Unconditional Election: The John Piper Fallacy in Romans 9.” For the last four days, there have been some estimated near 250 visits to the site. Who knew the outcome of just one post? Since then, I have spent some three days or so responding to comments made by a “Philip McGoo,” a gentleman who was quite proud to tell me he was a Calvinist...and yet, he had the humility to desire correspondence with me in the comments section of that post. Please visit that post and see the 6 comments or so posted there. I’ve been showing (with Philip as the example) that so few Calvinists really know what Classical or Reformed Arminianism really is. Most have never even heard of the words “Reformed” and “Arminian” put together, and there are some that even think the label is a contradiction or a misnomer. This does nothing to degrade the soteriological system of James Arminius; rather, what it shows is that very few Calvinists (if any at all) read anything but Calvin’s Institutes and books written by contemporary Calvinists (such as John Piper, R.C. Sproul, J.I. Packer, etc.). But is this not a biased approach to studying theology? Is Calvinism the only theology available today? No. Rather, it is one of a few theologies that, like the others, must be subjected to Scripture. This places Calvinism on the same level as the other soteriological systems. It is at this moment that some may say, “But you can’t lose your salvation.” But why is this merely “assumed”? Philip seems to think it is. But in his comment to me, he doesn’t explain why Jesus was not asking a real question of real possibility to the disciples. Instead, he sweeps everything together and says, “John 6 argues against your view.” This is called “the fallacy of cavalier dismissal,” where someone says “You’re wrong” and proceeds to continue on as if they’ve proven their point. But Philip did not prove his point. What one has to prove is that Jesus asks a hypothetical question in John 6:67. It seems that he doesn’t, for Peter then answers the question. Evidently, Peter didn’t think it was hypothetical, or a trick question...so what gives us believers the right to believe this in the current day? Philip is not alone. Calvinists have simply assumed such questions were hypothetical without answering the Arminian questions. Why is this so? How can one be right because “one thinks he’s right”? Where’s the logic in that, exactly? Now, on to Romans 8. Philip believes that this text, too, argues in favor of the Calvinist view. But does it? The famous verse I’ve heard quoted by professors and students alike is Romans 8:35-39, where Paul says that he is convinced that “nothing shall be able to separate us from the love of God which is in Christ Jesus our Lord” (NKJV). But how does this translate into an argument in favor of eternal security? If Romans 8:35-39 argues for eternal security, then there is a major problem indeed: for in Jude, Jude tells the church to “keep yourselves in the love of God” (Jude 20-21). So, if Romans 8 says I’m eternally secure, then how can one reconcile Jude 20-21 with eternal security? If God is going to keep me in His love (as many interpret Romans 8), then why do I have to “keep myself in the love of God”? “I subjoin that there is a vast difference between the enunciation of these two sentences: (1) ‘it is possible for believers to decline from the faith’ and (2) it is possible for believers to decline from salvation.’ For the latter, when rigidly and accurately examined, can scarcely be admitted, it being impossible for believers, as long as they remain believers, to decline from salvation. Because, were this possible, that power of God would be conquered which He has determined to employ in saving believers. On the other hand, if believers fall away from the faith and become unbelievers, it is impossible for them to do otherwise than decline from salvation, that is, provided they still continue as unbelievers” (James Arminius, quoted by John Wagner. 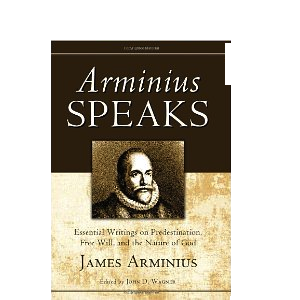 Arminius Speaks: Essential Writings on Predestination, Free Will, and the Nature of God. Eugene: Wipf and Stock, 2011, pages 307-308). Those who believe cannot fall away from salvation “as long as they remain believers”---that is, they hold on to their faith. The reason why those who are “currently” believing are secure is because “that power of God” is...”employed” to save believers. The sovereignty of God is directly linked to security in Christ. If there is no security at all, God is not sovereign. However, Arminius does clarify even further: if one falls away from “faith” (the condition for salvation) and becomes an unbeliever, his decline from “faith” results in an automatic decline from “salvation.” If 1) faith is the condition for salvation, and 2) someone declines from faith, then 3) that individual has also declined from salvation. This is Arminius’s syllogism from his above quote and this position seems rather logical. All of this is to say that yes, Philip, I have considered the consequences of conditional election. But I would like to ask: “Philip, have you considered the consequences of not studying systems other than your own? Have you considered how narrow-minded and biased such an approach is, that you would consume your time with Calvin’s Institutes but not read Arminius’s Works?” Those questions I pose not only to Philip, but to all Calvinists. If Calvinism really is the correct soteriological system, then what do Calvinists have to lose by studying Reformed Arminianism? The only individuals who choose not to study all sides of a story are those who want to believe what they do despite the evidence. Could this be true with Calvinists? I apologise pre-emptively for my tone, and that it has taken so long for me to reply. I’ve written a lot in response to your rapidly-expanding blog, but the following is my main problem with your reasoning throughout your responses. Here’s an example of a flawed hermeneutic: someone reads Ephesians 2:8-9 (“For by grace you have been saved through faith. And this is not your own doing; it is the gift of God, not a result of works, so that no one may boast”) and James 2:21-24 (“You see that a person is considered righteous by what they do and not by faith alone”), and favours the latter merely because it fits with their preconceived theology. Because, on first glance, there is a tension, but I’m sure you’ll agree that the two passages can be reconciled with a correct reading of each in context, and Luther’s quote “We are saved by faith alone, but the faith that saves is never alone,” also helps to shed some light as to how we can understand how the two co-exist as the living Word of God, etc. Here is my problem: With Romans 9:19-20 ( “Who can resist His will?”) you answer with Acts 7:51 (and further, John Piper’s theology wouldn’t even posit that it’s not possible to resist the Spirit; what he means by irresistible grace is that the Spirit will eventually win); with Romans 8:37-39 you argue Jude 20-21 (to the point of ignoring what Romans 8 says, and also ignoring the context of the Jude passage; a few verses later he balances verse 21 by saying “now to him who is able to keep you from stumbling and to present you blameless before the presence of his glory with great joy, to the only God, our Saviour, through Jesus Christ our Lord, be glory, majesty, dominion, and authority, before all time and now and forever”). With John 6, you reply with an biased reading. Jesus saw the hearts of those who did not truly believe, and said “This is why I told you that no one can come to me unless it is granted him by the Father.” Then those who didn’t believe left him. The text is clear on that. How you manage to read the passage and leave your final deduction as an unanswered question: “Was it possible for the disciples to turn back from following Christ,” with no response to Jesus’ quotes “this is why I told you that no one can come to me unless it is granted him by the Father” and also “no one can come to me unless the Father who sent me draws him. And I will raise him up on the last day,” I cannot understand. The latter seems to be a theologically true statement, which the context cannot deny. I would just like to balance that by saying that I disagree with a great deal you write, but it is still greatly encouraging to see a sister in Christ so dedicated to the study of all that is associated with our Lord. And I only write these things in the (as I see it) defense of the truth. thanks for responding. I started to wonder where you were...I've enjoyed our conversation so far. Now, in regards to your comments. As far as Piper's theology goes, if you're right in what you say, Piper would be a Molinist. If you agree with Piper, then you're a Molinist. And I would suggest you read my mentor's book: "Salvation and Sovereignty: A Molinist Approach" by Ken Keathley. The grace that you think can temporarily be resisted is labeled by Dr. Keathley as "overcoming grace." I consider it to be "overwhelming grace" (I hope you don't think this rude of me). Next, the verse following verses 20-21 in Jude. You seemed to have missed what Jude was saying: notice it says that "now to him who is able to keep you from falling." The text says that God is "able" to prevent us from stumbling, not that He necessarily will. You're assuming the language there means "necessity," when it really means "potentiality" or "possibility." If I say to someone, "I'm able to exercise today," does this mean that I will exercise today, without a doubt? no. In fact, I can choose not to exercise today, even though I am "able" (meaning that i possess the capacity or ability to do so). As a result, it is your interpretation of Jude 20-21 that is flawed. With consideration of your remarks on John 6, the issue is not whether they could come without Christ drawing them; the issue is whether or not they could resist grace. The text in John 6 says that those who later walked away did not understand Jesus because they did not come to understand. Look at the earlier verses of John 6. Why did they come to Jesus? because they were looking for physical food with which to stuff their bellies (see John 6:27). Then, they ask for a sign to believe Him (John 6:30), but this proves that they did not. Jesus had already done many signs, including fed the masses. This was just another ploy for them to get what they came looking for. He did not give them physical food but spiritual food, and this turned them off. Even when Jesus attempts to explain that He is "the Bread of Life," they murmur, complain, and simply do not understand. All this is to show that the Spirit is the one who brings about understanding. The Spirit is the one who convicts men and women of sin and righteousness, and judgment (Jn. 16:7-11). So again, this passage only proves human depravity and the necessity of the Spirit in conviction and understanding. This still does not prove your view. You cannot just point to verses and say, "See my implication?" You've actually got to prove why the implication must be believed. Jesus does say that "no man can come unto me unless the Spirit draws him," but how does this prove irresistible grace (or overcoming grace)? You've gotta do the homework to prove this is the case. In our last conversation, I think we established that you have not read Arminius due to "doctrinal pride" (your words). So, have you read Arminius yet? Have u bought any of Arminius's "Works" or read him online yet? You can attack me on my interpretations of the text...but I've read widely on Calvinism and its interpretations. You are not in the same boat, however: you have read none of Arminius. Don't you think there's something remotely wrong with calling someone on their own interpretations of the text while you have not considered the other side of the story? I also disagree with a great deal you write, but it is refreshing to find a Calvinist who is actually willing to dialogue. Look forward to us "beating each other up" (just kidding, lol) more in the future. God bless. No, I haven't. To be honest, I haven't read Calvin's Institutes either. And if you don't take issue with this, I would much rather read the latter first. I've spent most of my time in the Scriptures. And I still can't see any weight to most of your arguments. And Piper isn't a molinist. I don't know why you jumped from temporarily-resist-the-Spirit to Molinism, but I do know those two things are true, and your conclusion isn't. Also, here's something I wrote in response to one of your blog-posts somewhere, and of which I have no other purpose for... So enjoy! In response to “what does Philip mean by ‘unconditional?’” Both. The only difference I see is that latter casts the scope of the atonement to all, as well as softening the wording of His agency in one’s salvation, and the former limits the atonement to God’s elected people, whom He chose (hence, He has complete agency in their salvation). Again, I can’t readily accept your justification for resistible grace, on grounds that I earlier made (context, and heavier Scriptural weight to the opposing side). Secondly, in response to “does Philip define unconditional election as...” I don’t appreciate the dichotomy built, and I actually don’t think the quote supports it. “Faith forseen is prior to election;” doesn’t the latter still then hinge on faith? Of course I agree that all believers are saved, and all believers must have faith in the risen Lord Jesus Christ. Sorry, but I can’t see the logical progression. Unconditional election certainly doesn’t mean that God plays (as Mark Driscoll would say) duck-duck-damned, and that the faithless will get into heaven and the faithful into hell. But it is that God doesn’t choose to give any of us a gift of faith, nor His Holy Spirit, because of any of our own qualities, but by His own unknowable choice. - An common objection to God’s unconditional election (I’m not sure whether you hold it) is that God doesn’t actively choose the elect, but sees through a long hallway (for some reason) those who will accept the offer of salvation and, predestines those folk to be the elect. The problem with this idea, I think, is that it is necessarily limiting God’s sovereignty; were not these individuals “fearfully and wonderfully made;” doesn’t the potter have the same right to make pots for honourable use as dishonourable? God doesn’t just foresee who will accept His gift of grace; He creates them to do so, to illustrate His grace to the elect, and to illustrate His wrath and His justice to the reprobate. - You might then say: ‘but this means that God is choosing people in spite of everything in themself.’ When we are faithless, He will remain faithful, for He cannot deny Himself. Does this mean God is unjust? Certainly not! One final question: if election and irresistible grace are untrue (well, differently true), then why does Romans 9:19 exist? Paul is anticipating that this doctrine will be offensive (why would it, if a person's salvation depends entirely on their free choice in accepting it) and he prepares a response. You sound pretty heated about all this...which is much to your shame, I'm afraid. the fact that you even admit to not having read Calvin's "Institutes" is an even bigger shame. I mean, how can you call yourself a Calvinist if you haven't read it? I don't think you understand me...I have read all there is out there on Molinism, and your view of grace (John Piper's or whoever's) is called "overcoming grace." You really should go out and buy and read the work before you assume I don't know what I'm talking about. In addition, have you not read my profile? I am a student at a rather prestigious seminary, and am soon to pursue a Master of Theology in areas such as these. So before you assume that I've not done my homework and that I'm wrong, please understand that I've spent the last five years studying apologetics, greek, hebrew, and theology. I didn't create this blog overnight. I actually know what I'm talking about. My mentor wrote the book on Molinism. I've read it and am actually published in the Journal for Baptist Theology and Ministry. The editor of the JBTM, Dr. Steve Lemke, is a dear friend of my mentor's and mine. He is the provost down at New Orleans Baptist Theological Seminary. So again...I am published on the subject of Molinism and Reformed Arminianism at the tender age of 26 years old. I don't think you're carefully considering the reputation I've acquired on the subject of soteriology. The truth is, you seem to be more interested in providing reasons why I should like Calvinism than on actually discussing things with me. You have not read either Calvin or Arminius and it is rather arrogant that you would come to my site continually and attempt to throw your Calvinism at me. I have studied the subject...get it? I've done the reading. I'm not ever going to side with you. Calvinism to me is nothing short of heresy, and I will have no part of it. So no matter how much you say, "calvinism's right," I'll never believe it. You will not shake my confidence or my view one single bit. I suggest you get off of commenting at sites that discuss theology you don't know about and spend more time reading theology. Read a little Calvin and Arminius...and after you do, we'll talk. Until then, know that I pity you. It's so sad you're so arrogant, and think you're right...when you've done no research at all. Tell me this: who's gonna actually consider you a source on theology when you don't even read it??? Again...if faith foreseen is prior to election, as Arminius states, then God is electing individuals on the basis of faith---that is, whether or not they believe. So just saying that one has to believe does not cut it. You believe that God gives them faith after He chooses them. Your presuppositions have not been proven, nor have you provided Scriptural inferences to justify it. You aren't too well acquainted with philosophy. Maybe you need to go take a course or two in hermeneutics. With regard to unconditional election, where does the text ever say that election is based upon "God's unknowable choice?" Has God not given us the Scriptures, so that humanity can come to know what God expects of them? Your notion of God's unknowable choice sounds like Greek philosophy. Oops! I forgot---you haven't had good dose of philosophy!!! In Romans 9:19, Paul is not anticipating irresistible grace? Rather, if you do a little background homework, the reference of romans 9:19 is actually to Jeremiah. Again...do your homework. Your little tort of "Scripture supports irresistible grace" is not there, either. You did not provide an adequate explanation of Acts 7:51...nor have you proved the case for irresistible grace. I suggest you read up on this as well. This will be my last post. And should you respond again, I have the sovereignty (there's your word) to refuse to publish. God bless. Yeah, okay, maybe it's agree to disagree time. But really, I haven't let my posts get personal; I just talked about what I saw as incorrect, and what I saw as correct. I think you might have just let it get a bit personal. And okay, you're more learned than me. That wouldn't be hard, I've only been a Christian for two years. And I've never been to Bible college, I haven't studied the Bible as much, nor as rigorously as you. But in my immaturity, I do know that no-one can boast about wisdom or intellect; it's God who gave them to us, by His grace. And it is He who makes the wisdom of man foolishness, and who graciously gave us the Word of wisdom and of truth. So if I've seemed arrogant and blunt and stupid and inconsiderate, I'm sorry. Maybe total depravity isn't just theoretical. If you choose to ignore me from now on, that's your right; it's your blog. Maybe in ten years time, when I've been to prestigious bible college for a few years, read Calvin as well as Arminius and know a few famous people, I can come back to your blog and defend my position. You might not want to hear this, but I read your most recent post, and I'm sorry. I'll be praying for you and your sister. I lost my mother a while back too, I know how much of a hole it leaves. I am sorry if I said some hurtful things, or assumed that you were being haughty, etc., in any way. I just wanted you to know from my profile that I have done a lot of work in this subject. I know that you're still free to disagree with my conclusions (which you do, of course), but I at least wanted to say, while you may disagree, I have done the homework of sifting through and reading evidence. For me at least, when reading the Bible, there were things that I would read that would make sense one minute...and then I could read other passages and they would seem to contradict what I read earlier. The result of my struggles with the text is what drove me to study Calvin and Arminius, as well as read systematic theologies. I believe (as you do) that the Bible comes down on one side---either Calvinism or Arminianism. For me, if I didn't believe in the five points of Arminius, I would be a five-pt. Calvinist. What most people do not know is that Arminius was a student of Theodore Beza (Calvin's son-in-law and successor). Therefore, Arminius's change from Calvinism (hyper) to Arminianism was out of his own studies. Evidently, he stumbled onto the work of his opponents (before the theology was named after him) and decided that they had a point worth listening to. Before you knew it, Arminius abandoned much of his teaching under Beza and began to advocate the exact opposite system. For Arminius, the warnings had very little to do with it; rather, it was things like middle knowledge (which he held to) as well as the character and goodness of God. He just could not see God damning people to Hell without ever having died for them. I could go on, but I will say that while you're free to disagree with me, I've come to my convictions honestly. I don't see how the warnings cannot be real, and I do not understand how God's goodness could be maintained by damning someone to Hell. Even if it is said that God does it for His glory and that He does not have to save everyone, does it make sense to let people rot in eternal torment for eternity if God is the only one that can save them (and does not)? Humanity is ultimately dependent on God for its salvation...and if God is not willing to love every person and give His Son for them, why should we love them? Why is it that He tells us to love our enemies even, if some men are the enemies of God, and He has damned them to eternal destruction? Where is the love of God in that??? By the way, thanks for reading my tribute to mom post. I've made myself write a tribute post for every mother's day and birthday at the blog. It's been my own little way of keeping my mother's memory alive. I'm sorry to hear about your own loss. My parents had been divorced for 15 years when mom died...and she was not just my biggest human provider but also my dearest friend. I have a twin sister...but mom was my real twin. And yes, it has been hard, and it does leave a hole in your heart.